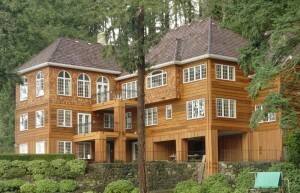 No other material can match natural wood’s beauty for exterior surfaces like siding and fencing. But if you don’t protect the wood from the elements, it can weather to an unsightly gray. Fortunately, it’s easy to maintain your wood siding and fencing with Messmer’s UV Plus wood stain. Messmer’s UV Plus, one gallon for every 100-200 square feet of wood surface depending on wood texture and density. Do not begin until you have read and understand all instructions. If you have questions, call us toll free at 1-800-731-3669, weekdays 8-5 Mountain time. Do not apply if rain is expected within 24 hours. In certain climates you may have to wait for a different time of year to do this. We recommend doing a small test area on your project to insure your satisfaction with color choice and appearance before proceeding with the entire job. Clean the wood surface with Messmer’s Wood & Deck Cleaner (Part A), or another high quality wood cleaner of your choice, then rinse thoroughly with clean water. For redwoods and some cedars, use Messmer’s Wood & Deck Brightener (Part B) to remove tannin stains if necessary. Rinse thoroughly with clean water. Make sure the wood surface is clean, dry and in good condition. You may need to wait a few days for the wood to completely dry depending on weather conditions. Cover plants, grass, concrete, trim, and any other areas you don’t want stained. Stir product thoroughly. Make sure that all pigment is mixed evenly into the stain. Apply one coat of UV Plus following label directions. If the wood is very absorbent and will accept additional UV Plus, you can apply a second coat “wet on wet” to the point of saturation, within 30 minutes of applying the first coat. A: Typically UV Plus needs to be reapplied every three to four years. The length of time will vary depending on the wood used, which direction it faces, and your local climate and sun intensity. In addition to this, more highly pigmented colors tend to last a bit longer than the lightly pigmented ones. A: Although it’s not a common problem on vertical surfaces, overapplication can lead to shiny spots and sticky areas. Be sure to wipe up any excess product about 60 minutes after application. UV Plus is a high solids product, and if overapplied it will not just evaporate away. It is designed to be a penetrating finish and does not dry properly if overapplied to the surface. Q: Why is it important to clean the wood before applying UV Plus? A: If you apply UV Plus to a dirty surface, the wood will turn dark and dingy. The oils and resins in the UV Plus will entrap the dirt and make it impossible to clean. By cleaning with a good quality wood cleaner like Messmer’s Wood & Deck Cleaner (Part A), or Wood & Deck Renewer and Brightener Liquid, you are properly preparing the surface for staining with UV Plus. All exterior surfaces collect dirt, dust and contaminants. It is necessary to clean them periodically to keep them looking good. We suggest using Messmer’s Wood & Deck Cleaner (Part A) for periodic maintenance cleaning. Power washers may be used either alone or in conjunction with cleaning chemicals like Part A Cleaner, but care should be taken not to damage the wood with pressures that are too high, or by spraying too close to the wood.